For literally YEARS I’ve been meaning to make some braies. Now, finally I figured out a pattern and got a chance to wear my test pair at an event last weekend. In a word.. they’re made of win.. in two words.. win and AWESOME!! Seriously. I will never go to another event without braies on. These take almost two yards of 58-60″ wide linen and 2 yards of drawstring (I use a flat cotton tape). The legs are 40″ wide and have selvedge at the bottom edge. Yes, I have big thighs. Shut up. The height of the leg pieces is half my fabric width. With this pattern the seam for the legs ends up in between my thighs.. but I totally don’t notice it. Attach the gusset to the legs. I’ve tried it with flat-felled seams and french seams. I find it easier to do with french seams. Roll and hem the top edge of the braies (~1/4″) to keep them from fraying. Add three large eyelets at the top edge (marked in RED on the pattern) offset down about 1″ so that they will end up on the outside of the braies when the self casing is added. Roll the top edge of the braies to make the self casing(~1/2″). 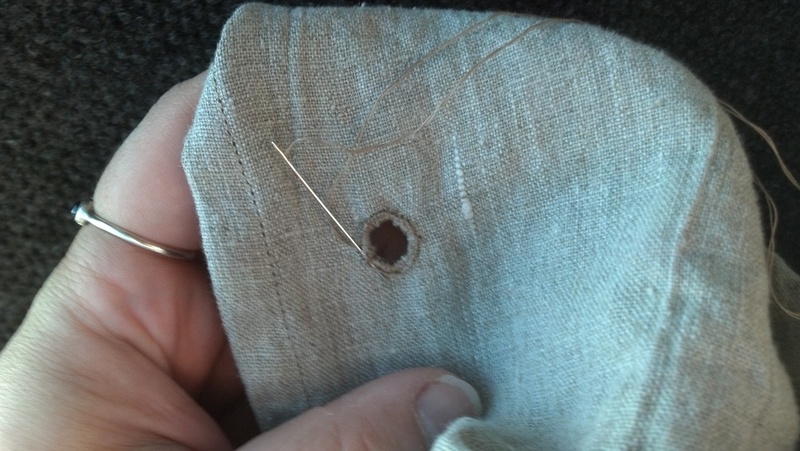 Feed the drawstring through the center eyelet and insert into the casing. When you have the drawstring completely inserted you should have both ends coming out of the eyelet in the center front of the braies. Tie a knot in each end of the drawstring so that they will not be pulled back inside the casing. 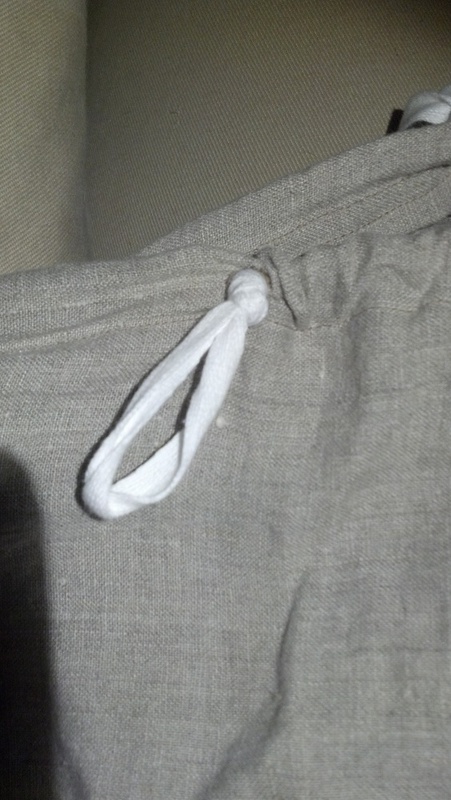 Pull the drawstring until one of the knots is just barely sticking out of the front eyelet. On whichever side you’re working, push any bunching of the casing past the side eyelet. 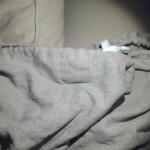 The casing and drawstring should be taut between the center eyelet and the side eyelet. 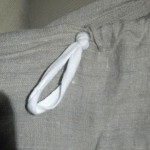 Pull a loop of the drawstring out of the eyelet that is on the side. Pull the loop from the back of the braies (leaving the drawstring between the side eyelet and front eyelet long enough that the front knot won’t be pulled back into the casing). Tie an overhand knot in this loop of drawstring. You should end up with knotted loops sticking out of each of the side eyelets.. and the ends of the drawstrings (with knots) sticking out of the front eyelet. The casing between the side eyelets and the center front eyelet should not be bunched up. The casing across the back of the braies, between the two outer eyelets across the back of the braies should be bunched up. These knotted loops will make the braies easier to wear. It will also cut down on the length of the drawstring that you need to hold the braies up. Added bonus: if you wear chausses, tie the chausses to the side loop to keep them from falling down. Someone asked me: Do they have to be white linen? Answer: Technically, no. You can make these whatever color/fiber you want to make them. Medievally though, I don’t have any examples in any color besides white/natural. So.. please yourself.. but if you want to match medieval images, stick to either white or natural. An eyelet finished with button-hole stitched. The eyelets are nearly the size of the tip of my pinky finger. 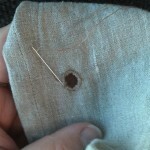 An eyelet with a loop coming out of it. Front of braies with loops and drawstring in place. After trying the nifty loop idea, I vetoed it in favor of having a second string go around the loop and tie off without knotting the loop like you have shown. I found the loop made bulky areas under my cote that I didn't like. Mari Asonte, not all of us are as slim and svelte as you are; some of us have excess weight & "rolls" to hide said loop… LOL (No offence meant Monica Kroger). 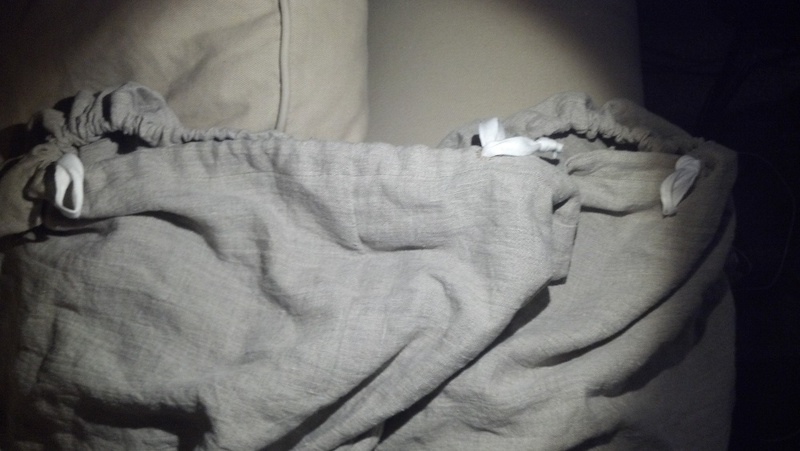 But I found that the linen was excellent in the humidity to keep thighs from chaffing. 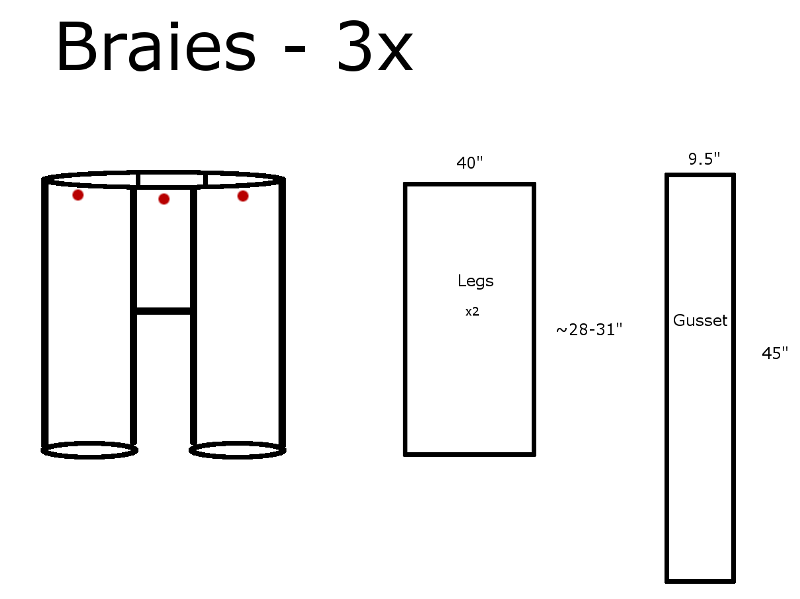 I want to make some braies for my nieces & nephew, & I really like your pattern & instructions, but I'm not sure how to figure out what to use for the measurements. 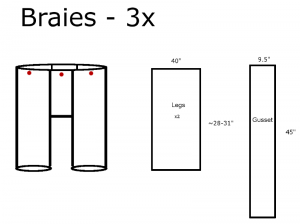 Can you tell me how you came up with the measurements you used? I started out with waist and thigh measurements and made up a sample out of muslin. Then I tweaked it until it worked for me. Does anyone know what size this makes? I’m interested, but completely new at sewing garb! Thanks! Looks like the pattern title says 3X. My guess is that’s the size. As shown this makes up about a size 3x. I recommend you make a pair out of cheap cotton/muslin and try it out and then tweak it from there.